A boy of 12 who fell to his death from the Humber Bridge with his mother was unlawfully killed, a coroner has ruled. Ryan Davies, who suffered from a condition that caused behavioural problems, died when he plunged 100ft from the famous landmark on 12 April. Hull Coroner Geoffrey Saul ruled that Ryan's mother Alison, 41, of Stockport, took her life in the same incident. She had suffered from depression and on three other occasions had tried to take her own life, the inquest heard. Ryan suffered from Fragile X Syndrome, a hereditary condition causing learning difficulties and behavioural problems. The condition, which involved autistic tendencies, meant he had no sense of danger and could be easily led, the court heard. In a statement, Ms Davies' mother Ann said her daughter had attempted suicide on three previous occasions. The first attempt was made at the age of 11 when she cut her wrists after becoming upset when the family moved from a rural area to an urban one. In 1985-86, Ms Davies was rescued after walking into the sea fully clothed at Eastbourne in East Sussex. And on another occasion she travelled to nearby Beachy Head, a notorious suicide spot, where she rang her sister telling her not to feel guilty. Her family reached her in time, but Mrs Davies said her daughter had become increasingly depressed and struggled to cope with her son's behaviour. "She felt like a prisoner in her own home due to the care Ryan demanded of her and his deteriorating behaviour," she said. Before leaving her Stockport home in April, the court heard Ms Davies left a suicide note in which she said she was going to travel to the Humber Bridge. 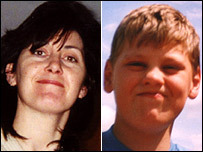 Within two hours of their arrival in the city, both mother and son had fallen to their deaths. HGV driver Terrence Jewell told the inquest he recalled seeing a woman holding a boy over the river side of the bridge's barrier but said he had thought they were playing about. Earlier, consultant paediatrician Peter Berchtold said that because of his condition Ryan would have accepted what his mother was doing, possibly thinking it was an adventure. His body was pulled from the River Humber on 16 April. Ms Davies' body was recovered on 29 April. Both had drowned. Ryan's uncle and aunt, Andrew and Lindsey Cook, hugged each other as the verdicts were announced. 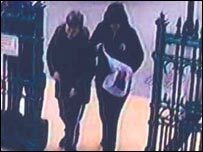 They declined to comment as they left Hull Coroner's Court, but a spokeswoman for the Fragile X Society spoke on their behalf. She said: "We love Alison and Ryan and miss them as much today as we did four months ago. "We celebrate their lives and cry tears of joy and sadness for their untimely passing. "We do not blame Alison for what she did. She loved Ryan so much and she tried so hard. Her bank of resilience had been depleted. "She deserved more happiness than she got in her life. She was a wonderful mother."